So did you make the most of your extra day in February to up your block count? Or were you busy trying to catch a husband? I had a great month of block making, surprising even myself — I made 106 blocks! I made 39 more blocks for my Whistle Stop quilt, and I think I now have enough done to set them together, which makes me very excited to have another UFO so much closer to finished! The rest of the blocks are for things I can’t show you just yet, as usual. Bummer! It’s time for all of you to report in! Comment or contact me and let me know your numbers. I’ll try to find time to update the Project page a bit more often — it’s a job! We have 99 participants! I was so hoping for just one more joiner, so we could at least hit 100 — anyone? It’s exciting to see all the numbers roll in. Some of you are highly productive! Some of you are swamped busy, and I understand that, too. Fortunately, this is not a race, so it’s all good. The prize winner for January is: Karen! Karen was off to a fantastic start with 160 blocks in January! She won’t have to do any more for a few months unless she just wants to! haha! 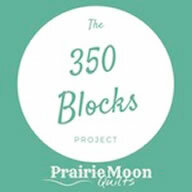 For the month of March, our goal is another 30 blocks for a yearly total of 80. You can check your totals and see what everyone else is up to on the main Projects Page here. January was a busy month trying to get stuff done for taxes. However, in February, I got 32 blocks done! Congrats Karen on being January’s winner!! I made 37 blocks in February, bringing my year-to-date total to 93 blocks. Oh my….I spent waaaaaay more time helping others in classes, adding borders, making a label and designing in EQ7 than making blocks! I believe I only made 2 actual blocks!! Well, I leave tomorrow for a Quilt Retreat and have my fabric cut for a new project. Let’s see how many of these 56 blocks I get made. March should be a better month!! Gee this is worse than any previous year. February was 23 blocks for a total of 42. Oh well, better than last month. 129 blocks for Feb 2016. I actually did more than I had remembered. I checked my notebook and counted 53 for the month! Glad I write them down, because I would not have remembered correctly. March should be a good month. I have quite a few blocks that are almost assembled, and I’m going to 2 retreats! Here’s to a good month… Cheers!! After an embarrassing January, I feel I’ve redeemed myself in completing 62 blocks for Feb. It only puts me slightly above the YTD total, but I’m happy with that. 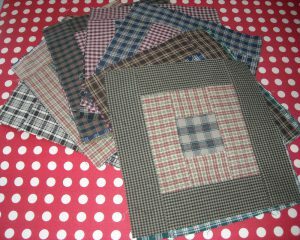 Busy month but mostly quilty-busy. I am reporting 120 blocks!! Question…One of the quilts I made had 100 3 1/2 inch blocks for the center. How do I count that? I was counting this morning I am at 41 for february. I got all the blocks done for the mystery quilt from hell. I got some of the blocks for the double charmed two quilts I got some orphan blocks gathers for a row quilt and made designed and made up two more blocks. I had a busy February, making 124 blocks. 51 QAYG string blocks were made and sent to someone else for her charity work. Then 17, 35 and 21 other blocks for 3 different UFO quilts. Two of those quilts even got finished. I am planning an even busier block-making March. I just posted my (pretty pathetic) February block count here. I completed 59 blocks for FEB. The “free” day didn’t help me much (1 block), lol. I finished 139 blocks for February. I am very competitive, so this is the perfect challenge for me. It helps me to be more productive. I got 25 blocks done. 3 more than last month, yea. Have a great day! I made 34 blocks in February. I got 86 blocks done this month. Might not get that many done next month. Some of these blocks are gonna have to be set together into something!! See you Saturday and start more blocks! February total was 35 blocks. So I just passed. Hopefully there is some sewing time early this month as from the 22nd I don’t think there will be much. 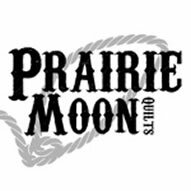 I am doing lap/twin quilts for the Indian tribes here in Maine. My hubby is also. But I am only counting mine. I have done 48 blocks for February. That’s a lot for me as I have also done 3 afghans for them also. 39 blocks for me. March shouldn’t be as busy for me, so hopefully I’ll get a lot done. 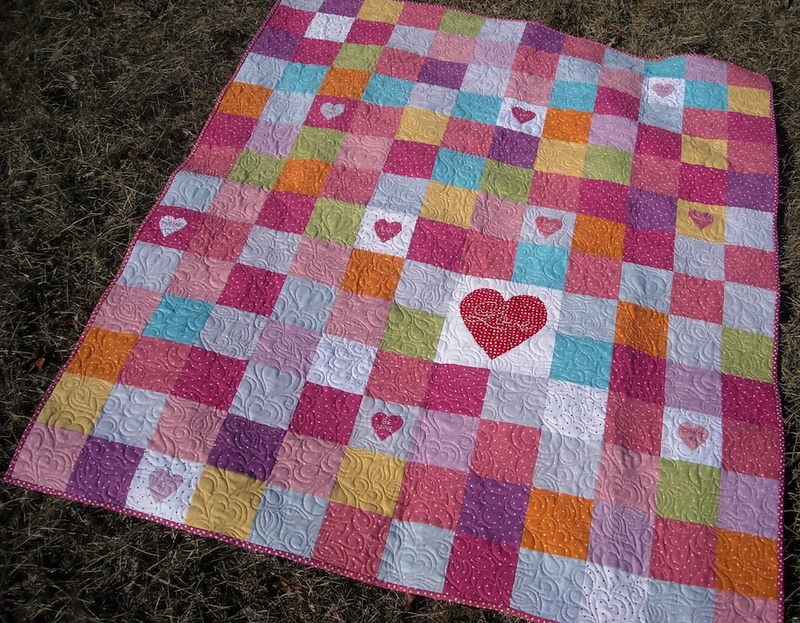 Love your candy hearts quilt–added to the list of quilts I want to make! My February total is 60 blocks. I have so many projects going and am busy trying to stay caught up. March should be more productive. Well, I made zero and am all right with that as my life and some of its issues needed attention which I have been giving copiously. March is a wonderful month and maybe will go out calmly for itself and for me as well! and I will have more time to do just as I please and make blocks!!! Well I am nowhere as productive as you are but I made 60 blocks, the extra day brought 2 more! I made 61 blocks for February! Wow, You had a lot of blocks. I made 62 blocks this month, but more importantly, got three quilts quilted. Whew! One more to go and I will be caught up. I racked up 31 blocks in February. I made a jelly roll quilt top that I am gauging at 30 blocks and the other block was for the Stash Bee. I am hoping that I can even do better in March! I am pleased and am also sure that March will be a lower count while I quilt some of these tops! I managed to finish 99 blocks! 89 for a quilt top and 10 towards the next one! What is working for me is the push to finish projects…..I am loving it. I did 100 blocks this month I am still working on the 1/2 inch HST. I need 94 more to make. Which I will finish in March and then hopefully I will finish my project with all of those 1/2 inch blocks. 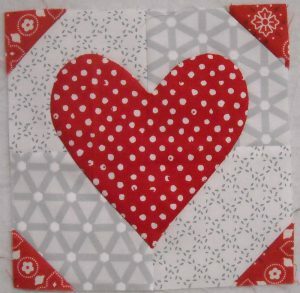 February saw 29 new blocks, for a total of 90. 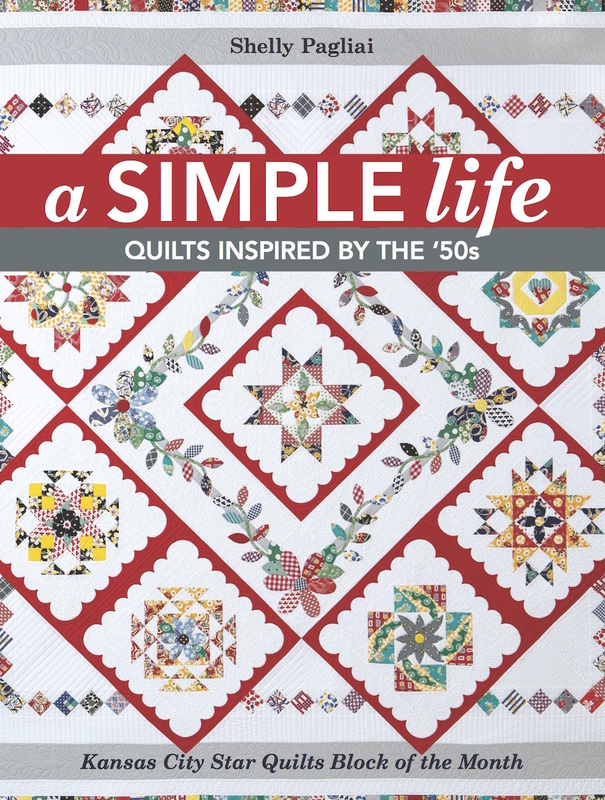 Put me down for 32 blocks – five of which were Splendid Sampler blocks, three stars for a WIP, and the rest for three baby quilt tops. Was busy moving into a new apartment in February but managed to make 12 blocks. Hi, Shelly. 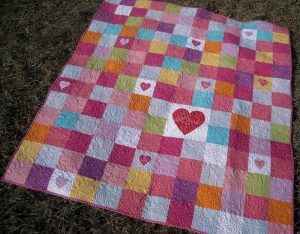 I love your candy hearts quilt! I’m really excited to see your whistle stop quilt come together, too. You did have a good month, and all that we can see is very cute. I’m sure it’s the same for what is still secret too. I managed 24 blocks and 2 tax returns. Tax returns earn double points. Well done on your total. I made 64 blocks in February! 41 blocks including seven blocks I made to finish piecing a quilt top that was in my UFO pile since 1992! Now I have to find the perfect fabric for two small borders. The original pattern didn’t have borders, but I think the top is begging for them. I was able to make 204 blocks Whew!! never knew I sewed sew much!! I made 16 blocks in February and completed a baby quilt. February was kinda a slow month. Had quite a few cross stitch blocks to make. My total between the two is 18 blocks. February was a pretty solid month for me with 31 blocks finished. That makes 72 for the year so far. Not super fast, but not standing still either. I am pleased that those blocks have added up to a few finishes, but I hope there are more coming–at least one in March. This month I really made up for last month. Most of the progress was on a single quilt and a few stray block from a leader ender project. 168 Aviatrix Medallion and 4 leader ender blocks. That is 172 for February. Oh dear – I only made what I will call 1 block this month – which I have turned into a picture for my husbands 60th on 17th March – so can’t blog about it yet! 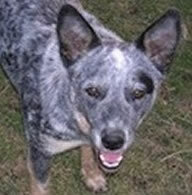 And making some shorts for my grandsons birthday on 7th March – so still unable to post! I made 65 blocks in February. It was a good things I participated in a sew along at Aunt Reen’s Place or my block count would have been much lower. I have a busy March so I hope I get some blocks sewn. I made 145 blocks in February…loving retirement!! I did 51 blocks in February. I made 72 blocks in February. Finished another quilt. Started on some paper pieced blocks. Slower month for me. I am figuring I made 36 blocks last month. I think I forgot to report my blocks for January, so this is for two months. I ended up with 393 blocks for January & February. Over 200 of those are 9-patch blocks, and I finished two quilt tops. Finally have a count for February! I added 134 blocks to my total. In February I completed 74 blocks. I completed 111 blocks in Feb. Need to go back and check where I am for March.